Back to United States of Batteries index page. 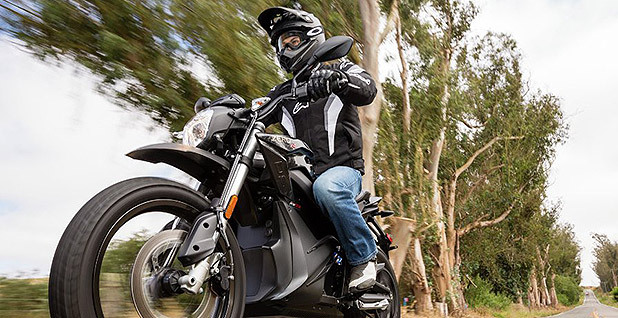 Zero Motorcycles is one part of an emerging energy storage hub in the San Francisco Bay Area — one of five regions that could anchor a growing industry. Photo courtesy of Zero Motorcycles. Part three of a series. Click here for part one and here for part two. The United States would seem a shoo-in to dominate the emerging energy storage industry. Domestic companies already make batteries for every possible use, from medical implants to soldiers' kits to warehouse forklifts to massive systems that can absorb the output from solar farms. But it is a disjointed effort that isn't prepared to seize two mammoth markets that are poised to take off in the next decade: electric vehicles and "stationary" storage for buildings and the electric grid. Tomorrow's energy storage market will be huge. Can America take it back from Asia and create factories and jobs. Click here to view the series. Hubs are key, as other industries have demonstrated. A cluster brings together skilled workers, good universities, scrappy entrepreneurs and wealthy benefactors, along with government policies that break down barriers. No such hub yet exists in the United States, but five proto-hubs show promise. Where are they? The maps below plot the evolving ecosystem. Dots indicate companies with commercial products, as well as larger firms with energy storage divisions. Other important nodes are omitted, such as universities, national laboratories and corporations that dabble in energy storage but don't have something to sell. This is not an exhaustive list. Energy storage enterprises are sprinkled across the country, from Austin, Texas, to Seattle. Some states have rules, either enacted or proposed, that nurture the energy storage economy, such as Colorado, Florida, Hawaii, Massachusetts and Oregon. But the five regions listed here might have the critical mass to become hubs. 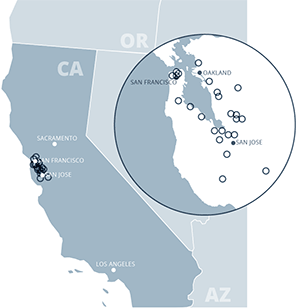 No place on Earth has a more diverse energy storage ecosystem than the San Francisco Bay Area. It starts with consumer electronics that require batteries, from speaker maker Jawbone to camera company GoPro to a boutique phone supplier called Apple Inc.
Alongside them, but much more recent, are solar panel makers like SunPower and solar installers like Sunrun, which are beginning to add storage to their offerings. The area also has chemicals suppliers, materials makers and software firms that were founded to serve Silicon Valley's main business — computing — but are spilling over into energy storage. In the past few years, a number of startups serving the electric grid have emerged. Some, like flow-battery maker Primus Power, are focused on large-scale bulk storage; others, like Stem, Advanced Microgrid Solutions and Green Charge Networks, are overlaying lithium-ion batteries with software to aggregate storage and interact with the grid. Meanwhile, a gaggle of startups are trying to improve lithium-ion or develop new chemistries. Electric transportation also has a presence, from Tesla Inc., whose auto plant is the largest manufacturing employer in the state, to Zero Motorcycles to a maker of electric skateboards. Almost every major carmaker in the world has a research center here. Semiconductors, the foundation of the computer revolution, were invented here, and the electronics expertise never left. Much of it can be found at Stanford University and the University of California, Berkeley, as well as the region's three national laboratories: Lawrence Berkeley, Lawrence Livermore and the SLAC National Accelerator Laboratory. The Bay Area's energy storage industry has a willing partner in California's Legislature. The state has a goal of producing 50 percent of its electricity from renewable sources by 2030 — a goal that won't be possible to meet without storage to manage the unpredictable output from solar and wind farms. The overwhelmingly Democratic Legislature required the state's utilities to add 1.3 gigawatts of energy storage by 2020, and makes hundreds of millions of dollars available to energy storage projects under a rebate program. California has far and away more energy storage deployed in homes, in businesses and at utilities than anywhere in the country. Despite all this glowing promise, these many players don't yet view themselves as an industry. A couple of trade groups would like to change that. One is the California Energy Storage Alliance, which focuses on the electric grid, and another is CalCharge, a consortium that helps storage startups access the world-class facilities at the Bay Area's national labs. While Tesla's Gigafactory in Nevada grabs the headlines, there are arguably more kilowatts of lithium-ion batteries now being produced on the shore of Lake Michigan. The cluster spans the southern part of the state and centers on the auto industry. "There's an interest in staying cutting-edge and figuring out how to keep the jobs here," said Liesl Clark, president of the Michigan Energy Innovation Business Council. The western anchor of this belt is LG Chem's plant in Holland, which fabricates the battery packs for several models of U.S. electric cars. Holland is also where Johnson Controls, the world's largest maker of traditional lead-acid auto batteries, built the factory for its small but growing lithium-ion business. 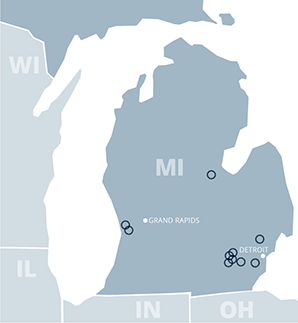 To the east, the university town of Ann Arbor is a center for research, development and small-scale manufacturing. That's where the University of Michigan keeps its Battery Lab, a $10 million test facility that mimics industrial production. It's fully booked, with 75 percent of its customers being Michigan businesses. Ann Arbor is also home to a small factory where Mahindra, the Indian industrial giant, assembles the batteries for its U.S. electric scooter company, called GenZe; Sakti3, a university spinoff that creates solid-state batteries; and the research arm for Navitas, a domestic remnant of A123, a battery maker that received $130 million of support from the Obama administration before going bankrupt (Energywire, Aug. 11, 2016). Head east on Interstate 94 to reach Ford Motor Co.'s 1.7-million-square-foot factory in Ypsilanti, a section of which assembles electric vehicle battery packs. Ford has committed to investing $4.5 billion by 2020 in "electrified vehicle solutions," including 13 models of EVs. Near Detroit is General Motors' Brownstown Battery Assembly Plant, which puts together the batteries for the Chevy Volt and other GM hybrids. In Troy, LG Chem designs its batteries for the grid. To the north, Xalt Energy makes lithium-ion cells and battery packs for buses and trucks, but announced layoffs last year after a big Chinese contract fell through. 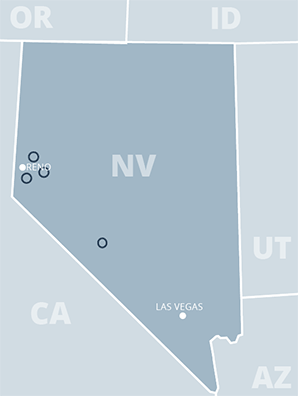 Nevada belongs on this list because of exactly one building: the Tesla Gigafactory, which when completed will be one of the world's largest structures. Its scale is hard to imagine. By 2020, the company expects to produce 35 gigawatt-hours of lithium-ion battery cells, or more than are made in the rest of the world. But it is a hub without spokes. The state lured Tesla with $1.3 billion in tax incentives in hopes that it would anchor a massive industrial park in the empty desert outside Reno. So far, only one Tesla supplier has located nearby. Tesla's mighty maw might get lithium mining started in Nevada, though it is slow going. The company has signed an exploratory agreement with Pure Energy Minerals, to the southeast in Clayton Valley. Nevada has a handful of other energy storage concerns. Faraday Future, a copycat of Tesla, planned to build a factory outside Las Vegas but has drastically scaled back its plans amid funding problems (Energywire, Dec. 20, 2016). Two other energy storage startups are growing in the Reno area, but neither has a relationship with the Gigafactory. New York doesn't have much of an advanced energy storage industry yet, but the state government is sure trying. 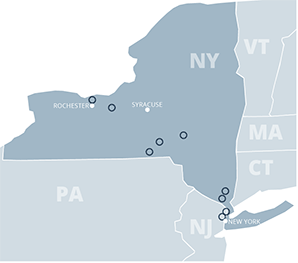 Lawmakers in Albany played a key role in forming the New York Battery & Energy Storage Technology Consortium (NY-BEST), which now has 150 members. The organization, in cooperation with industry, is luring talent with a $1.5 million battery prototyping center at Rochester Institute of Technology and a $23 million testing and commercialization center in Rochester. In February, an Irish storage firm said it would move to the Rochester campus and bring 17 jobs. The Empire State also has a $590 million industry of traditional energy storage players. They include BAE Systems, which builds hybrid buses in Endicott; Raymond Corp. of Greene, which makes forklifts; and Ultralife of Newark, near Rochester, which makes batteries mostly for the military. The new wave of energy storage is composed of a small constellation of startups, including EnerMat, Voltaiq, Eos Energy Storage and Urban Electric Power, along with a passel of university spinoffs that aren't yet selling products (Energywire, Nov. 19, 2014). New York had a program, now complete, to provide incentives to energy storage projects that would reduce load in the state. Like California, the state has a goal of obtaining 50 percent of its electricity from renewable sources by 2030. The state's effort to remake the electricity grid, called Reforming the Energy Vision (REV), is not yet complete but is expected to be favorable to storage. New York is the only state to have studied its prospects. In a study, it estimated that the New York energy storage industry, now worth shy of $1 billion in revenue, might grow to $9 billion by 2030 and employ 27,000 people. Quite by accident, North Carolina has become one of the biggest and most diverse battery hubs in the country. But it is so far under the radar that the local chambers of commerce don't even track it. "There has been literally no strategy" to develop an energy storage ecosystem, said David Doctor, the president of E4 Carolinas, a trade group for energy companies in the two Carolina states. "Most of it is naturally occurring, and they tend to build on each other." The activity is centered on Charlotte. A maker of lithium-ion materials, Celgard, operates there, as does a battery division of Parker Hannifin, a Fortune 500 maker of control technologies. Both have become suppliers to Alevo, a Swiss company that moved into a retired tobacco plant on the outskirts of Charlotte and builds container-sized batteries for the electric grid. SGL Carbon, which makes graphite battery parts, is in the state, as is FMC Lithium, a major supplier of the metal. To the north of FMC, the German conglomerate Saft operates a high-capacity battery plant. The Raleigh-Durham area has become a center for smart-grid companies, a vein of technology closely allied with batteries. There, the Swiss giant ABB studies energy storage at a research center.